URBANA - Recent storms that swept through southern Illinois left heavy wind damage in many corn fields, leaving producers in a quandary about what to do with the downed corn, said a University of Illinois Extension animal systems educator. "Can this damaged corn be salvaged for corn silage?" is being asked of Dave Fischer, who is based in Edwardsville. "The answer to this question depends on the plant moisture, maturity at the time of wind damage, stalk integrity, and the weather conditions that followed the damage," he said. "The bottom line is that good silage management protocol must be followed when trying to salvage wind/weather damaged corn as a nutritive feed product for livestock." Fischer outlined the steps producers need to follow. The quality of corn silage will depend greatly on the moisture level at time of harvesting, he noted. Harvesting corn silage too high or too low in moisture will result in poorly fermented feed with possible problems related to reduced palatability and mold-causing organisms. "In order to achieve optimum quality ensiled corn silage, the silage moisture level must be between 62 and 70 percent, depending on the storage structure," said Fischer. 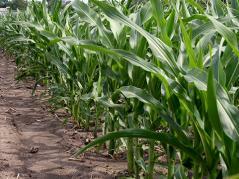 "Therefore, be cautious when deciding the correct time to chop wind-damaged corn for ensiling. Even though corn higher in moisture can be chopped and fed daily as green chop, do not plan to put it into storage until proper moisture levels can be achieved." Recommended levels for whole-plant moisture will vary for different storage structures. Adequate moisture is needed to get good packing and air exclusion for an oxygen-free environment and a low pH created by a quick and proper fermentation. Fischer said the following moisture levels are recommended for harvesting and storing quality corn silage in various storage structures: horizontal bunker silos and piles--65 to 70 percent; bag silos--62 to 70 percent; and upright concrete stave silos--62 to 67 percent. "It is recommended to take representative chopped samples to a forage testing laboratory for a quick moisture/dry matter analysis before beginning the silo filling process," he said. "Other methods to determine moisture levels in corn silage can be accomplished on-farm with a koster moisture tester and microwave ovens. "However, the operator technique is extremely important in achieving accurate estimates of corn silage moisture content with these on-farm practices. Therefore, a lab analysis is the preferred method because it will greatly reduce the sample variability and result in a more accurate reading." Producers should also consider the use of inoculants, he added. "Weather-damaged corn may be lacking in the necessary sugars and lactic acid bacteria for proper fermentation," he said. "Therefore, the use of inoculants containing lactic acid bacteria is recommended to help ensure a good fermentation for the corn silage in storage. "In addition, the use of inoculants can help improve dry matter recovery from the silo and animal performance."